I updated the link to the quiz...hopefully, this will work for ya'll now! Sorry about the bad link! 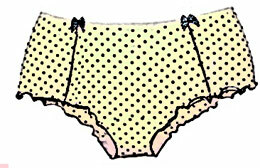 You are a pair of Polka-dot Boyshorts! Many people are often envious and jealous of you. You are original but not too bold. You will stay out of the spotlight and be productive. You may be reserved or quiet but not afraid to speak your mind when the right time comes. You may be viewed as a push-over but you are anything but! Go here to take the test yourself!